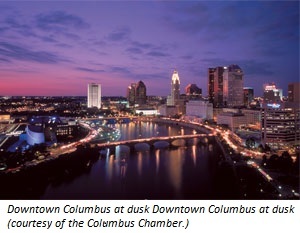 Columbus, the capital of Ohio, is the largest city in the state and the 16th largest in the United States. 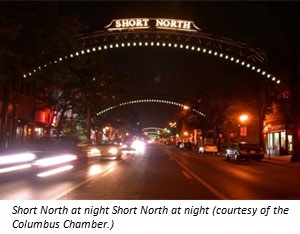 There is a lot going for Columbus—it’s a hip town that is also affordable. Columbus is centrally located; it is only a 2-3 hour drive to Ann Arbor, Bloomington, Cincinnati, Cleveland, Detroit and Pittsburgh. Traveling to and from Columbus is easy because the main airport is under 10 miles away from the Philosophy Department and there are more than 150 daily direct flights to and from cities all over the country; there is also free Wi-Fi throughout the airport. Nature: “Between 14,000 and 28,000 years ago, the Wisconsin Glacier carved a network of ravines that forms a grid crisscrossing major waterways in Franklin County. Some ravines contain rare or endangered plant species that may justly be considered ecological treasures. The rocks and soils of Franklin County ravines tell a story of ancient oceans and recent glaciers and a long time in between. The bedrock of eastern Franklin County is limestone, shale, and a little sandstone.” There are great local or nearby outdoor activities (e.g., hiking, biking, rock climbing, white water rafting) discussed below in Outdoors and Excursions. Columbus Dispatch: Major Daily Newspaper. 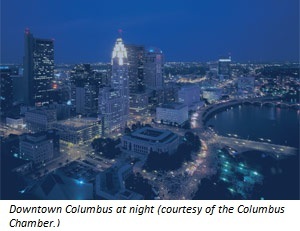 Columbus Alive: Free Weekly Newspaper. Franklin Park Conservatory: Built in 1895, these botanical gardens are situated within the 88 acres of Franklin Park. It is a premier horticultural and educational institution showcasing exotic plant collections, special exhibitions, a signature collection of work by glass artist Dale Chihuly and a permanent installation by renowned light artist James Turrell. COSI: The Center of Science and Industry is a large science museum. Columbus Zoo and Aquarium: Well known for its Director Emeritus Jack Hanna, its newly born Asian elephant calf, among its large collection of animals. Columbus Museum of Art: Houses an outstanding collection of nineteenth- and early twentieth-century American and European modern art. This collection includes major works by Monet, Matisse, Picasso, Renoir, Hopper, and O´Keeffe. The museum is recognized for extraordinary regional collections. It hosts a continuous program of national and international traveling exhibitions. Thurber House: Listed on the National Register of Historic places, the Thurber House was the home of author, humorist, and New Yorker cartoonist James Thurber. Currently, the Thurber House is a living museum and a literary center for writers and readers. Wexner Center for the Arts: This is an incredible resource for all things art through four components: OnScreen, the OnStage, the OnView, and InSight. OnScreen: the film/video theater has regular screenings of independent films, international films, new documentaries, rare or classic films, and films that are too edgy for chain movie theaters. OnStage: there are live theater, dance, or music performances that range from those appealing to a family audience to those appealing to the student or adult audience. OnView: the exhibition gallery features international, contemporary artists. InSight: the center offers an extensive list of entertaining and educational programs for those of all ages and backgrounds. The Ohio State University’s various departments (e.g., OSU Dance, the OSU Music, and OSU Theatre) have frequent and fantastic performances. Indeed, the OSU Dance Department is one of the leading dance departments in the country and has regular and excellent performances that are extremely affordable. The university’s Wexner Center for Arts (see below) also brings in some of the best cutting edge theater, dance and music. In addition to the shows produced through The Ohio State University’s various departments and facilities, Columbus has quite a rich culture for the performing arts; there are many shows of all types in beautiful, historic venues, e.g., Opera Columbus, the BalletMet Columbus, the Columbus Symphony Orchestra, the Columbus Chamber Music, the Promusica Chamber Orchestra, the Contemporary American Theatre Company (CATCO), the Jazz Orchestra, and Six-Strings Concerts. CAPA: formed in 1969 to save the historic Ohio Theatre from a wrecking ball. Now manages several of Columbus’ historic theaters. CAPA at the Lincoln Theatre: First opened in 1928, the Lincoln Theatre is a landmark in African-American and jazz history. After extensive renovations, the Lincoln has reopened as a multi-use, state-of-the-art performing arts and education center. CAPA at the Palace Theatre: Designed by Scottish-born architect, Thomas W. Lamb in the spirit of France’s Palais de Versailles, the 2,827-seat Palace Theatre is located at the base of the LeVeque Tower. Adorned with a chandelier, grand staircase, a mural, a hall of autographed pictures, and a fountain, the Palace is a delightful destination for an evening of the arts. Originally a vaudeville house, special attention was paid to the theatre’s acoustics when it was built-consequently, there’s not a bad seat in the house! CAPA at the Southern Theatre: The oldest surviving theatre in central Ohio and one of the oldest in the state, the Southern Theatre opened in 1896. The Southern was designed for theatrical touring productions and later accommodated silent films, vaudeville, first-and second-run motion pictures, dance, country music reviews, and community events. In addition to the University's sports teams, there are opportunities to see professional hockey (NHL’s Blue Jackets), Major League Soccer (Crew), and the Columbus Clippers (AAA affiliate of the Cleveland Indians). Jazz and Ribs Festival: jazz and ribs, what more does one need? While many of the activities/events mentioned above are actually quite affordable, there are several night-time activities that are popular among graduate students. Ladies 80’s: Skully’s Music diner has an eight-year tradition of Thursday’s ladies’ night with 80’s music was recently featured in Spin Magazine; both graduate students and professors in the Philosophy Department have been caught shaking their booty on many a night. Karaoke: there are a few venues in town that cater to the graduate students who enjoy putting on a show for one another. Some of the regulars are the Ravari Room (a bar with regular live music, karaoke, and great pizza next door), Little Rock Bar (great beer selection with decor of music memorabilia), Village Idiot (dive bar with a good draught selection), and Ethyl and Tank (close to campus with good beer and food). Columbus is also home to a burgeoning craft beer scene. The easiest way to check out all 28 breweries that have opened up in the past five years is to take a trip on the Columbus Ale Trail. Graduate favorites include Seventh Son, Land Grant, North High, and Lineage. Because Columbus is a city, one might not think of it as a fantastic place for outdoor activities. In addition to our proximity to some beautiful state/national parks and forests (see “Excursions” below), there is plenty to do within the city itself. Highbanks Park: has 100-foot high shale bluffs that tower over the Olentangy State Scenic River, over 11 miles of trails, a great sledding hill, beautiful ravines, and two Native American burial mounds. Blendon Woods Park is a 653-acre metro park with an 18-hole disc golf course (and pro-shop), 1-foot deep skating pond, monarch butterfly mansion, and many miles of hiking or pet trails. RecParks: In addition to the Metro Parks in Columbus, there are around 280 parks in Columbus’ recreational park system. Whetstone Park has more than 136-acres with athletic fields, river views, hiking trails; it also has the Park of Roses, a 13-acres garden setting featuring over 11,000 rose bushes in addition to other specialized gardens. See also: Goodale Park, our Hayden Park, the Schiller Park, and Topiary Park. Like craft brewing, coffee shops have been popping up all over Columbus. To explore the coffee scene, Columbus shops have come together to create the Columbus Coffee Experience. Graduate favorites include Stauf's (Grandview), Mission Coffee Co. (Short North), One Line Coffee (Short North), The Roosevelt Coffee Shop (Downtown), and Boston Stoker (Victorian Village). Jeni's Ice Cream: family-owned and operated; multiple award wining artisan ice creams that are all handcrafted in Columbus, with mostly fresh, local ingredients and some responsibly-raised exotics from around the world. North Market: a public market that is home to dozens of unique, independent merchants and farmers. There are butchers, bakers, candy makers, fishmongers, green grocers, and restaurateurs. The market place is a great place to eat all kinds of amazing food and to buy fresh produce, meats, poultry, seafood, ethnic food specialties, flowers, and gifts (from local artists). Co-ops and Local Grocers: Lucky's Market, Weiland's Gourmet Market, the Bexley Natural Market, and Whole Foods (while not a local store, there are two locations in town—one of which is the second largest store in the chain). Pizza: there is a long-standing debate about the best pizza in town; but, most seem to agree that the top contenders are: Adriatico's, Hound Dog's, or Mikey's Late Night Slice. Restaurants: in addition to some great food at cafés and bar/restaurants already mentioned elsewhere, a few favorites: The Refectory, Alana's, the Basi-Italia, Kihachi, Wolf's Ridge Brewing and G.Michael's Bistro. Vegetarian Options: while there are a number of restaurants and cafés already mentioned that have excellent vegetarian options, a few of the favorites that specialize in vegetarian fare: Brassica and Pattycake Vegan Bakery. Hocking Hills: an hour away for plenty of activities (canoeing, kayaking, horseback riding, hiking, rock climbing, mountain biking, camping, etc.) in 9 state parks and forests. The graduate students have a tradition of camping or renting a cabin in the Hocking Hills or by one of the closer metro parks. Cedar Point Amusement Park: two and a half hours to “roller coaster capital of the world”. The park holds the world record for the most roller coasters, has the world’s second fastest roller coaster, and has the world’s second tallest coaster. The park has more rides (roller coaster and otherwise) than any other amusement park. Appalachian Mountains: about four hours to the foothills of the Appalachian Mountains (e.g., the Monogahela National Park in West Virginia and the Daniel Boone National Forest in Kentucky) where there is fantastic back packing, hiking, camping, rock climbing, white water, mountain biking, etc.